One of the most important components of our work is our wall decoration. We work with over 3000 unique elements to craft the best imaginable designs for our clients. Right from the beginning, our designers map out the measurements of your walls and piece together a few compositions that could work. We focus on following the lines and contours of your house and highlighting them with our decorative mouldings. Along with our trims, we offer many beautiful accessories to complete the look. Our columns, pilasters, wall sconces and mosaic tiles all help to create a perfect harmony with our designs. Whatever your taste, we have something special for you. Our wall decor adds a unique touch to any house, whether its heavy luxurious wall paneling, or simple modern framing. Our designers will work closely with you to understand your taste and find exactly what you are looking for. If you’re looking for something clean and simple to outline your walls, we have the perfect options for you! 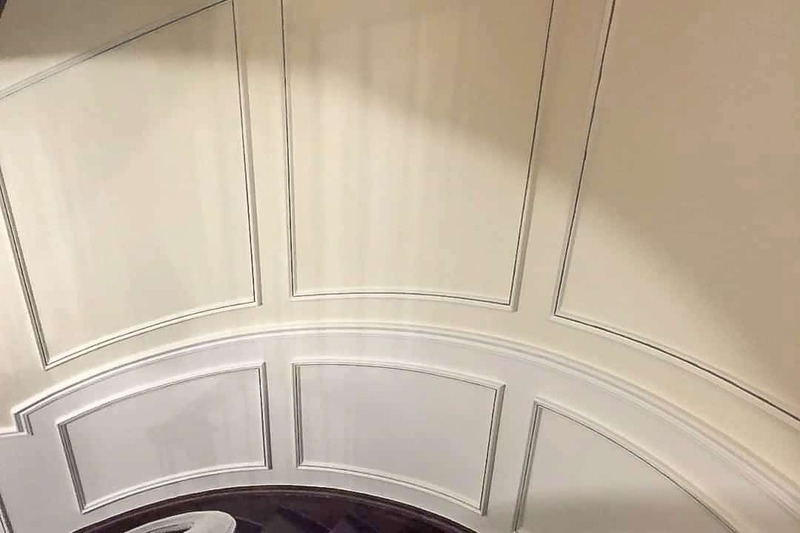 We carry a wide assortment of chair rail mouldings, wainscoting and baseboard trims. All our pieces come in white, two-toned or custom painted and we have many intricate designs to choose from. We offer a special array of ornamental mouldings if you want to get the full package and style your house like a palace. However, if you don’t want to go over the top, we can fit your house with a dentil cornice or one of our other contemporary options. We also carry flexible trims that work nicely around spiral staircases and curved walls. Check out our post on wall moulding ideas for more. At Lux Trim, accent walls are our specialty. Just take a look at the many eye-catching designs featured in our recent projects. 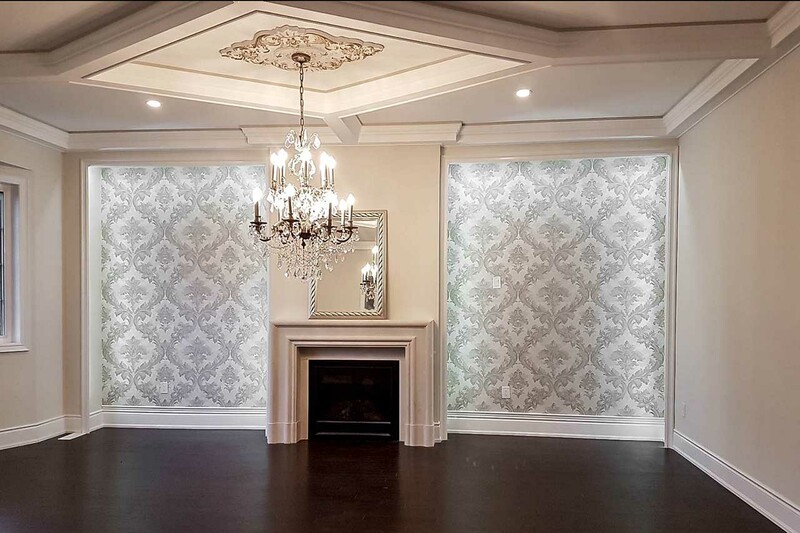 We love to combine our wall frames with Italian damask wallpaper to add some spice to a boring, empty wall. 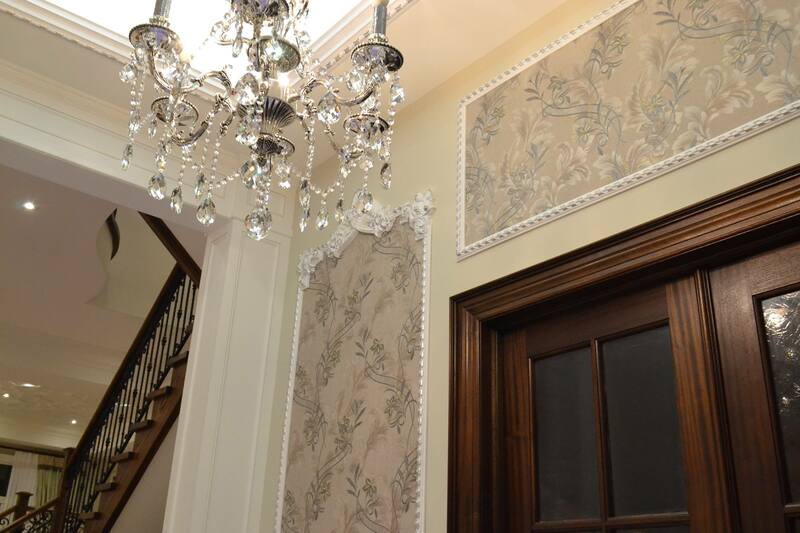 With over 200 beautiful wallpaper styles at our disposal, we make sure that every wall design has its own personality. For something outstanding, consider our 12-piece wall panel composition, which we hand paint to match the colour of your furniture and accessories. More of our unique displays can be found on our accent wall ideas post. Need some more wall decoration inspiration before you get started? Check out our Houzz Projects page or our Gallery to see unique wall decoration ideas from our projects.